In December 2007 Michael Gravel suffered a near-fatal run-in with a pulmonary blood clot. He spent the last 16 days of 2007 in a hospital. 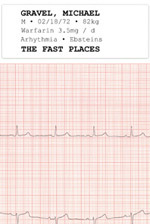 Emerging from the ordeal with a renewed sense of hope and empathy, The Fast Places is a short response to those events. Cars, friends, blood, and mortality all make appearances in this collection, published in early 2008. A book that is as much an extended prayer as a thank you. 24 pages; saddle-stitched with a recycled ‘Sandpiper’ cardstock cover, clear vellum inner leaf. Limited edition of 100 copies.